Option data itself can be used as directional indicators. Sometimes these are direct indicators, meaning that "smart money" is operating in the option market. We will look at techniques for spotting and trading that activity. The discussion of contrary techniques will extend into other areas as well, all technically based that have been researched and developed into trading systems. 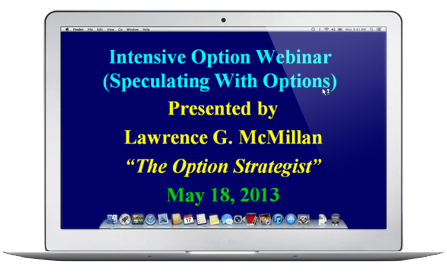 Finally, as is always the case with McMillan seminars, Larry will divulge and update his highly profitable trading systems, including the Previous Daily Range system, the October Seasonal Trade, and others. The power of the content in this portion of the seminar alone makes the seminar worthwhile.